Prince Andrew, The Duke of York, is now the first Royal to join Twitter. 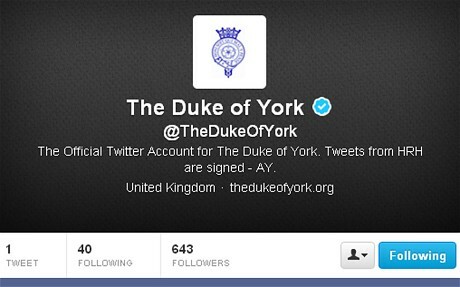 With the Twitter handle '@TheDukeOfYork', Prince Andrew will be signing the tweets he writes himself 'AY'. Prince Andrew's first tweet was simply, “Welcome to my Twitter account”. Followed were pictures of the Prince with students at a Black Country college. The only other Royal to tweet so far has been Her Majesty herself. The Queen has been known to favour modern technology. In 1997 she launched the roayl.gov.uk website, then in 2006 she issued the Christmas Queen's speech as a podcast. She even started a popular YouTube channel in 2007 that has over 125,000 subscribers.